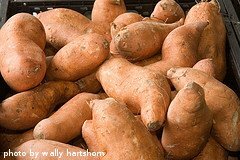 Sweet Potato Varieties - What's the Difference? There are a few different sweet potato varieties available to the backyard vegetable gardener. They vary slightly in size, color and texture. Some have a more red flesh, while others feature more of an orange color. Some store a little better than others. Some varieties have a higher sugar content, while others feature a more nutty flavor. We are often asked about what sweet potato variety we like best. Our favorite is the classic Beauregard, which is a large sweet potato with deep orange flesh. It's good for baking, frying, pies and casseroles - very versatile. This variety is probably one of the more popular varieties to grow for both backyard gardeners and commercial growers. 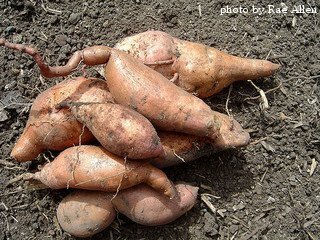 There are other varieties of sweet potatoes that are available through online seed stores, catalogs, etc... We encourage you to grow a couple of different varieties at first, to determine which is your favorite. Click on the following links for information about growing your own sweet potatoes.